I see you this Mother’s Day. I hold your heart in mine and ask for God’s grace to find you. May you be comforted in your loss or in your longing. May your eyes be opened to those you have “mothered” through your love and care and nurturing, whether children have filled your home or not. And may you be filled with sweet memories of the special women in your own life who are as mothers to you, even if your own is gone. Mothers and mother figures everywhere are deserving of our honor. You are appreciated… and I sincerely hope there’s someone in your life to help you know it. it's funny that i am reading this post right now because it's what i've been thinking about all day today. it's also what our pastor spoke about in his sermon. he knows from personal experience since he and his wife were never able to have children. i think that we should always be aware and sensitive to the feelings of others in all situations. my prayer is that all women will feel honored and blessed today…not just the mommies! i recognize that photo!! good message, Adriel. thank you. If Mothers Day is so hurtful, they should ban it completely! Oh, Adriel this was perfect. I have a college roommate that has recently lost her unborn child. I was not sure how to address today being mother's day. Your post was perfect, infact I forward it to her with my happy mother's day wish. I was still uncertain how it would be taken, and I was really relived to find out that she was very greatful for my wish and it has opened the door for others to wish her a happy Mother's Day. I hope that it will help her in her healing. Thank you so much for this post. I have a friend who after many, many years of fertility treatments had her final round of invitro fail this weekend. Heartbreaking. So many women struggle with infertility, or never have their dreams of motherhood realized. I myself went through some infertility issues, and I am always very open to speak about them. I think we need to make it less of a taboo topic. These women deserve to be honored as well! I had a young child ask me on Mother's Day several years ago if I was a mom. My answer: "Yes, I just haven't had my kids yet." Such a great post… Thank you for talking about this! I've spent 4 years as a Mommy. The first year, I was so overwhelmed I barely paid attention to my own mother, the second year was better, I remembered to honour her and got some special treatment myself too, the third Mother's Day was a complete blur with a newborn in the house, and this year I had a lovely day and found my own mother a special gift. But some of these other people you talk about in your post were with me in my thoughts, and I didn't really know how to navigate 'Mother's Day' with them. Your post has showed me a way I might share the day with anyone, even those who we are afraid of hurting by shining a light on their struggles or sadness. Of course, it needs to be approached delicately and with sensitivity, but I think avoiding it (as I did with my neighbour…who delivered my baby but never had children herself, and my friend, whose mother died young) is far more awkward. Hi, I googled “mothers day to those who have lost” and I found this page. Such a fitting post as I know so many who have lost children & mothers over the last few years. Adriel Booker recently posted..i’m a mom. and i am perfect. What you wrote is really beautiful. I forgot to mention that I wanted to share this on Facebook. I found this perfect page after searching for “mother’s day for women who almost were mothers. Thank you so much. I hope you don’t mind that I posted the link to this page on facebook. Happy Mother’s Day to you, Adriel. I’d like to adapt this for a meditation for a Father’s Day I’m planning. Would that be alright? If so how would you like it to be credited? What a beautiful idea Mer! And thank you for asking. Will it be an oral presentation or something you’d like to post online? It will be an oral presentation during a church service, but I could email the adaptation to you if you’d like. And yes, I’d love to see the adaptation you make – not because I want to “approve” it by any means, but because I think I’d be inspired by it! Sounds wonderful. Thanks Mer. Have a beautiful service! Adriel Booker recently posted..Who are you? I would also add stepmoms to the list. They do all the work of a mom, but don’t get to spend mother’s day with the child and get none of the appreciation. Thanks Kelly, absolutely! Appreciate your insight. Not sure if you’re a stepmom or not, but if so I hope your husband/partner does something this year Mother’s Day to help the kids recognize your contribution to their life. Maybe a friend of yours has the type of relationship where they can drop a subtle hint to him?? I hope you don’t mind I have taken this and posted it on my Facebook page. I have given you credit. If you do I will remove it but it speaks to so many women within my church who will be suffering this Mother’s day. My mother has been passed now for over 22 years and I still feel the lose each and every day. Many of the women in our church not only have lost mothers but have either never married or have remained childless after many years of attempting to conceive. Some have even lost babies. Thank you for this beautiful expression of love and understanding. Of course Helen. Thank you for your heart and concern to others. I hope this little piece can be an encouragement to those in your circle that may head into Mother’s Day with mixed emotions. May God bless you. Mother’s day is a day for anyone who has filled that void in a child’s life! Stop making women and men feel like you must be 21 to 30 to enjoy this great day!!!!!!!!!!!!!!!!!!!! 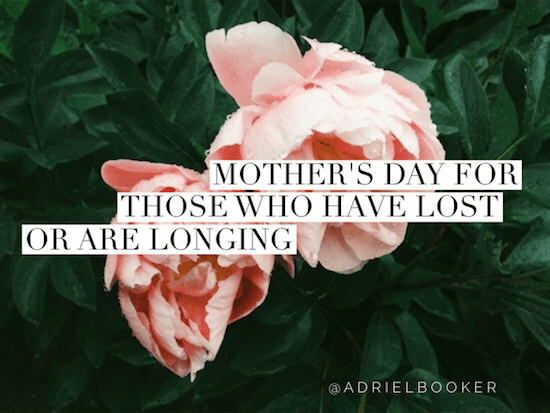 The post for Mother’s Day for those who have lost or longing is beautiful. Beautiful and touching – I posted this on my Facebook page, along with a link to your website. I’ve been feeling for all of those you mentioned there, and have seen them post sad messages on their timelines. I hope this makes their day a little better. Thank you Rick. I hope so too.